As she turned the corner of my house and gracefully walked across the lawn headed into the backyard patio, I couldn’t help but to stop what I was doing and stare. The sun shining through the leaves upon her golden face, like spotlights from heaven guiding their Angel’s way. The warm breeze gently lifting her dress in the most teasingly romantic motion revealing smooth luscious bronze legs. Her lips glistened a warm Pacific Rose type of hue, her smile so rich and enchanting I could feel her positive vibes from 20 yards away, her eyes looking up, piercing through my soul… This is my memory from the exact moment I met Mary at a summer barbecue. “I knew Mary was the one the moment our lips first touched and our hearts collided. My plan began 1 week before the day I was going to ask her to marry me; 1 week before Tuesday, August 22nd. I write love “notes” to Mary almost every single morning via text, this time they were a bit different. Starting 1 week before heading off to Italy for a trip, unbeknownst to Mary, that would change our lives, my plan was to write the beginning of the love note in Italian and then “translate it for her underneath”, hoping that she would not have time during her busy morning work to google translate it 😉 I literally told her in a series of texts in Italian Monday 8/14 to Thursday 8/17, that I was going to ask her to marry me… I thought this was a subtle romantic prelude to the best moment of our lives soon to come! As we walked down the beach my real plan began… she stumbled upon a package on a beach chair that was just sitting there out in the open. As she looked closer she noticed it had a tag on it and it was addressed to her: Mary. She looked at me and smiling and began to open it. 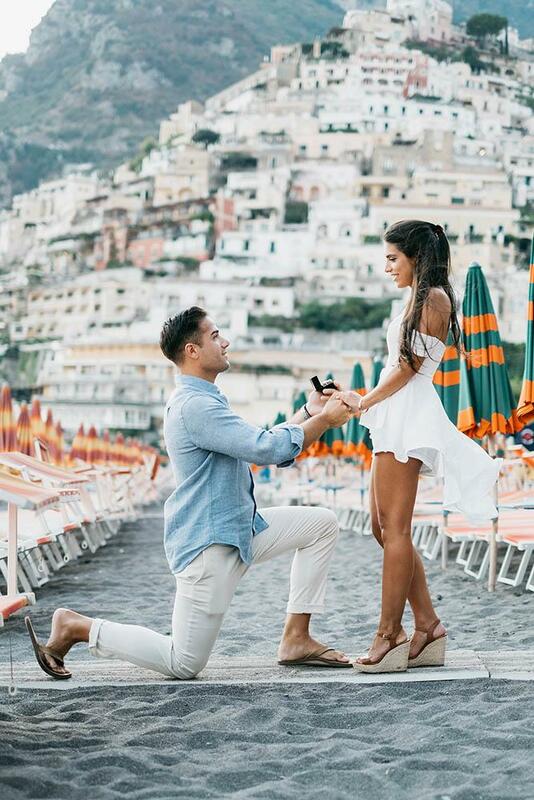 It was a watercolor painting I had commissioned of that exact moment that was about to happen, me on one knee proposing with Positano in the background! I pulled her into position and got down on 1 knee to recite a little love note I memorized for her. 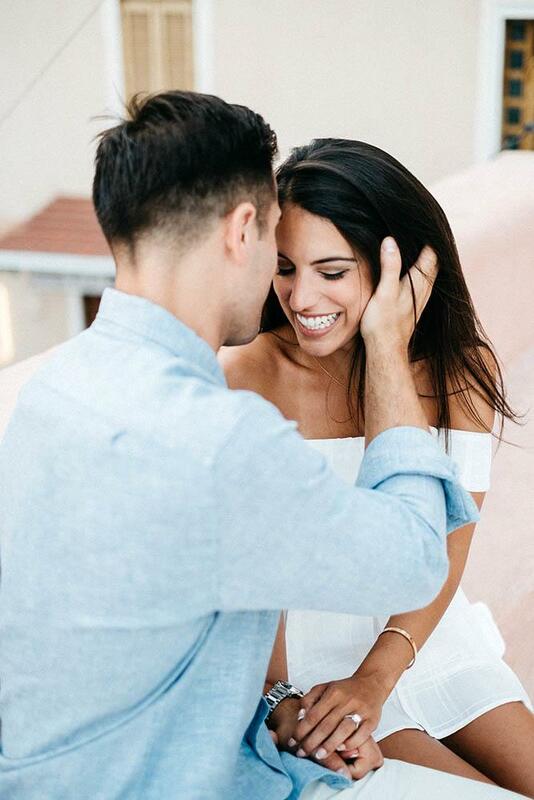 She began to cry and said “Yes”. Then we walked down the stairs and approached our private candlelit terrace with pink and white roses all around and pink petals sprinkled over the cobblestone floor, our very own Italian musician playing the mandolin greeted us to be seated and serenaded us all evening long as we danced and drank champagne! Our congratulations Jon & Mary !